Sous vide is a relatively new method of cooking where you cook meat or vegetables in a vacuum-sealed bag in a water bath at a steady low temperature for many hours. It brings out better flavor and texture and since all the cool kids are doing it, we wanted to try it too. 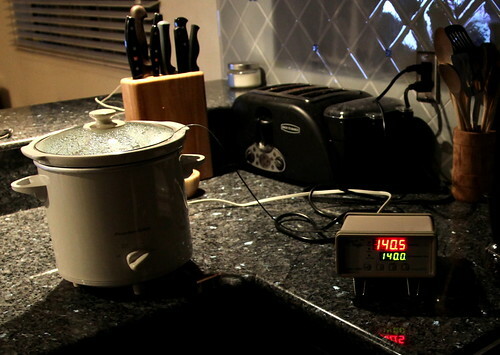 I got Sous Vide Magic(SVM) which controls temperature of the water in the rice cooker/crockpot. Rubbed steak with salt and pepper and sealed it in ziploc bag (at that time we didn't own a vacuum sealer, so we used the water immersion method to get most of the air out of the bag) and dropped it in the slow cooker which had warm water ~140F. Dropped SVM's temperature probe in the cooker and connected cooker->SVM->power. SVM maintained the temperature at 140F. Cooked it like this for 1.5 hours and then seared the steak on hot cast-iron skillet to develop crust (mallard reaction). End result was juicy and flavorful medium cooked steak! Sous vide is pretty easy and produces great results, so looking forward to experimenting with it more.